Surprisingly Few Urban High School Students Take The ACT Or SAT : NPR Ed In 30 out of 50 cities studied in a wide-ranging new report, the rate is less than 15 percent. But the majority of four-year institutions in the U.S. still require students to take one or the other. 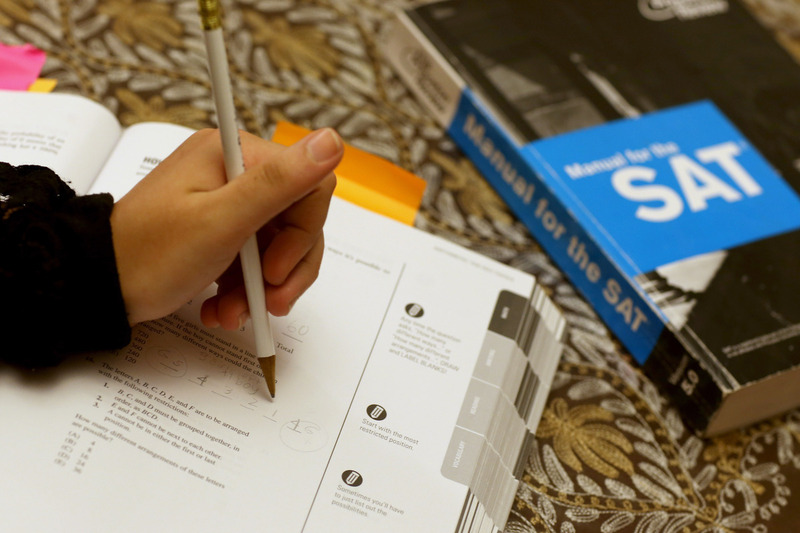 Suzane Nazir uses a Princeton Review SAT preparation book to study for the test on March 6, 2014, in Pembroke Pines, Fla.
Waking up early on a Saturday. Sharpened No. 2 pencils and a calculator. For teenagers headed to a four-year college, taking a standardized entrance exam such as the ACT and SAT is typically a requirement. But it's far from a universal experience. In 50 of the largest U.S. cities, examined in a new report from the University of Washington, Bothell's nonpartisan Center on Reinventing Public Education, fewer than 1 in 3 students takes either of those tests in a given year. The rate of taking the SAT or ACT in those cities topped out in Memphis, at just 30 percent. In three-fifths of the cities, it was less than half that. While there's a trend toward test-optional admissions at some colleges, the majority of four-year institutions in the country still require one or the other. The findings are included in a broad report by the researchers, gathering a variety of publicly available information on school performance in those 50 cities. Mike DeArmond, one of the authors, said the idea for the report came from "a problem we were encountering in our own work" studying urban school systems. Namely, more and more cities have several different sectors of public schools: the regular district, charter schools, plus some kind of recovery or turnaround district that may be under mayoral or state control. A typical example, DeArmond says, is Detroit, which he described as having "a crazy quilt" of publics, state-authority schools and 12 different charter operators. So CRPE used census data to include all the schools that fell within city limits for 50 of the largest urban areas. The goal is to give a full picture that mayors or other urban leaders could use to benchmark their local performance. The study examined indicators like state test scores, graduation rates and suspension rates. For the most part, the report documents the same inequity in access to opportunity that we're used to seeing from all types of statistics everywhere — including access to the SAT and ACT. But there are bright spots that indicate what certain cities might be doing differently. New Orleans, says DeArmond, closes or restructures its lowest-performing schools at a high rate. Washington, D.C., actually seems to be able to improve its lowest-performing schools while keeping them open. And Santa Ana, Calif., near Los Angeles, is a predominantly poor, Latino city that boasts a 90 percent high school graduation rate.